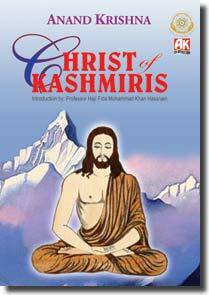 Official Site for the Book of Christ of Kashmiris by Anand Krishna. This book is about the Ever-Living Jesus and His Gospel for Modern Man and Woman. Jesus not only lived in India, but also shed His mortal body there to attain to Immortality. Anand Krishna does not dwell on the “pros and cons” regarding the historicity of Jesus, rather on the relevance of Jesus' teachings in modern times. He not only discusses Jesus, Muhammad, Khidr, Jhulelal, the Mahabarata war, the 9/11 tragedy and the Bali bombing but also the roots of terrorism and offers a solution. He believes that “love is the only solution” and this book is a running commentary to that end. In the pages of this “must read” book, he shares his experiences with love. This very important book reveals what no author before him has revealed. Thank you for letting me be a part of your vision. You are able to put into practice (reality) what I have wanted or thought about for years. It gives me immense pleasure to help in any way I can. Sufi Guru Ananda of Indonesia is a man of God destined to play an important role in building a world, which is free from malice, hatred and turmoil. It is a great pleasure for me to have the Darshan of this great saint of the century. His aura depicts a powerful light and his face brings joy and bliss. I wish him to live long in the service of mankind. Warning: This book is very subjective. and as Sage Yuzu Asaph by the Kashmiris. If you doubt it, then this book may not be for you!